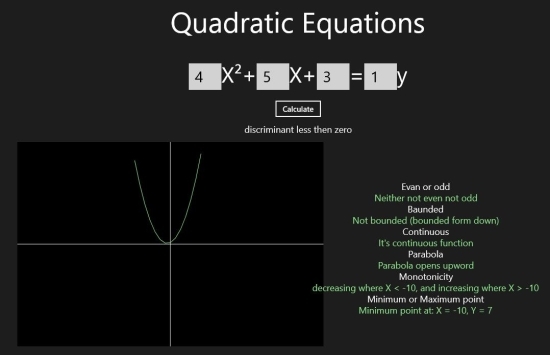 Equation Analyzer app for Windows 8 is likely to prove quite helpful for students learning maths. 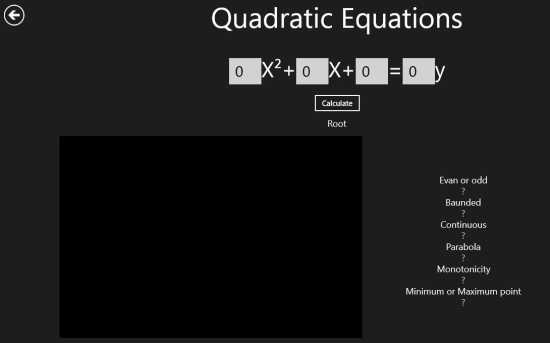 This free Equation Analyzer Windows 8 app allows you to trace linear as well as quadratic equations on graph. This way it performs much more than just finding the roots of equations i.e. it lets you understand the real meaning of that particular equation. 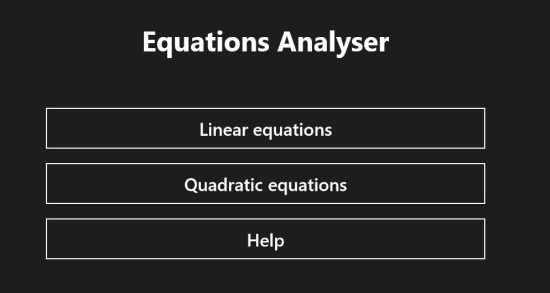 This Windows 8 equation analyzer app can be easily located under “Education” section of Windows Store. It’s 100% free and very simple to use. On launching this Windows 8 math app, you will be presented the interface as in screenshot below. There you will be presented the buttons; one for tracing the linear equations and other for tracing quadratic equation on the graph. Now, click on either of the “Liner equations” or “Quadratic equation” buttons. Then, you will be redirected to a new window with equation in standard format. Once you have placed the values of all constants in appropriate text-boxes, click on “Calculate” button and in no time the graph will be presented to you with other derived information. I tested Equation Analyzer for different equations and it showed the graph for most of them. To test it further I entered some huge figure and it ended up in “Axis haven’t got enough space” error. Other important thing is that in case you have a longer (non-standard) equation, then it will be your responsibility to bring that in standard form. Simply open this URL in any supported web browser. (IE 10 or Advance). Then, click on “View in Windows Store” button at top-left. Upon being redirected; click on “Install” button and within a minute this 178kb app will be installed on your Windows 8 machine. * No extra set of permissions will be required. This application is stand-alone and works without dependencies. Students are likely to be benefited from this simple yet useful Equation Analyzer app for Windows 8. You must know that solving an equation is one thing and understanding it is a different thing. I have no issues in recommending it. Anyway, if you are interested in getting access to college level educational tutorials then consider trying KhanAcademy or Stanford University Apps for Windows 8.